Credit Karma Tax is tax preparation software that simplifies filing and supports all major IRS forms and schedules. The technology presents an online alternative to traditional manual personal tax preparation. A step-by-step wizard asks questions similar to how a human tax preparer does it, then users enter data. Credit Karma Tax works in the background by taking the answers and inputting them onto the correct sections for forms and schedules. The service then transmits the relevant data to state return for proper filing. The software is part of the Credit Karma platform, which provides free credit scores and reports on a weekly basis. The said system, which is required to access Credit Karma Tax, also monitors dubious activities and alerts users for potential problems. Credit Karma Tax’s primary benefit is how is supports virtually all common forms and schedules for proper tax preparation and filing. Covered requirements include itemized deductions, capital gains and losses, and self-employment income. The software boasts of a user interface that is clean and allows proper navigation. Tax preparation’s three fundamental parts are visibly displayed at a horizontal toolbar on the uppermost part of the screen so that users can easily choose Basic Info, Federal Taxes, and State Taxes. Having a straightforwand interface helps users work faster, so that more tasks can be completed. Credit Karma Tax presents two options for navigating through the site so that users can practically customize the way they utilize the software. After users enter their basic information, they can choose the tax scope that applies to them out of the lists provided at the start of each section: such as Wages & Income, Deductions, and more. 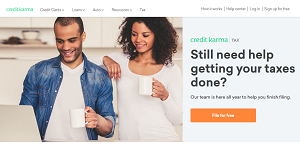 Users can be sure that they do not skip important steps of tax preparation as Credit Karma Tax makes statements or posts questions directly every screen. After a user has completed every topic that applies to them, Credit Karma Tax transfers applicable data to your state return if it’s supported. Provided answers are also double checked; if the software catches an error or omission, it offers to revert to the offending screens to fix them. If you are considering Credit Karma Tax it might also be beneficial to examine other subcategories of Best Tax Software listed in our base of B2B software reviews. Since each organization has unique business wants, it is prudent for them to abstain from looking for a one-size-fits-all ideal software solution. Needless to say, it would be pointless to try to find such a system even among market-leading software platforms. The clever thing to do would be to jot down the various essential factors that need consideration such as key features, finances, skill levels of employees, company size etc. Then, you should do your homework thoroughly. Read some Credit Karma Tax reviews and investigate each of the other systems in your shortlist in detail. Such comprehensive homework can make certain you weed out ill-fitting systems and choose the app that offers all the features you need for business success. How Much Does Credit Karma Tax Cost? Credit Karma Tax can be used for free, and imposes no SMB or enterprise pricing fees to worry about. We realize that when you make a decision to buy Tax Software it’s important not only to see how experts evaluate it in their reviews, but also to find out if the real people and companies that buy it are actually satisfied with the product. That’s why we’ve created our behavior-based Customer Satisfaction Algorithm™ that gathers customer reviews, comments and Credit Karma Tax reviews across a wide range of social media sites. The data is then presented in an easy to digest form showing how many people had positive and negative experience with Credit Karma Tax. With that information at hand you should be equipped to make an informed buying decision that you won’t regret. What are Credit Karma Tax pricing details? What integrations are available for Credit Karma Tax? If you need more information about Credit Karma Tax or you simply have a question let us know what you need and we’ll forward your request directly to the vendor.